The best-selling Ford F-150 stays at the top of the heap thanks to constant innovation that makes it easier to get work done while increasing luxury and comfort. Class-exclusive features, advanced powertrains and smart technology make the F-150 highly appealing, and a wide spectrum of trim levels and options (including a turbodiesel) gives buyers the right combination for their needs. The Ford F-150's best-in-class towing capacity is now up to 13,200 pounds. With the F-150, variety is the name of the game: three cabs and beds, a variety of engines (including a diesel coming later in the model year), and trims that run the gamut from a simple work truck to the luxurious Limited to the off-road-ready Raptor. Cool options make it easier to tow or go off-road, and make the F-150 downright luxurious. But they come at a price, and the F-150 can have a sticker price over $65,000. If you only need light towing and hauling capability, a midsize truck may be a better value. For 2018, the F-150 receives a more powerful, more efficient base engine; a turbodiesel option; new exterior styling; more power and more efficiency; expanded availability of a 10-speed automatic transmission; new safety features; and an increased towing capacity (now 13,200 pounds), still the highest in its class. The 2018 F-150's interior is rugged and attractive, but above all, it's easy to use. There are new interior colors for 2018, and plenty of available cool features like 3-prong power outlets, adaptive cruise control that can bring the truck to a full stop, a 4G LTE Wi-Fi hotspot, active park assist, and the ability to have the Sync 3 infotainment system read text messages to you while you drive. The SuperCrew (crew cab) is extremely roomy, with rear-seat legroom that bests some full-size sedans. Because the F-150's floor is flat, even the dreaded middle rear seat is comfortable. Ford's full-size pickup continues to use a military-grade aluminum body, but for 2018 that body has been restyled to emulate the looks of the big-brother Super Duty lineup. New grilles, headlights and wheel designs help differentiate the different trim levels. Aside from the truck's new look, much about the design was born from necessity. The tailgate is available with a pull-out step that makes it much easier to get into the bed to manage payload. There are also pop-out steps on the sides that help with the same purpose. The new 3.3-liter base engine is lighter than the 3.5-liter it replaces, has more horsepower and torque -- and better fuel economy, too. It's a good base engine with enough get-up-and-go for the daily drive and carrying payload. It's not blazing fast, but it's easy to get to and stay at freeway speeds. The 2nd-gen 2.7-liter turbocharged EcoBoost V6 has 25 lb-ft more torque, so it's even quicker off the line. Its combination of speed, efficiency and capability makes it our favorite of the lineup. With the 5.0-liter V8, acceleration is natural and linear. The 3.5-liter makes the F-150 fast when unloaded and a capable, stout hard worker. Towing is effortless. The F-150's SuperCrew cabin is roomy, offering excellent legroom and a comfortable ride. Suspension and brakes were designed so that whether the truck is loaded or unloaded, the ride doesn't suffer and brakes feel confident and strong. For 2018, the Ford F-150 Manufacturer's Suggested Retail Price starts at just under $30,000 for a regular cab XL (all prices include $1,295 destination). XLT pricing begins at $34,265. The Lariat starts at nearly $42,000, which sounds like a bigger price jump than it actually is, because every model above the XLT comes as a SuperCab (extended cab) or larger, while the XL and XLT prices are for regular cabs. The Raptor begins at $51,080, the King Ranch at nearly $53,000 and the Platinum is $55,450. Pricing is comparable to trucks like the Ram 1500 and Chevrolet Silverado, but as is the case with many full-size trucks, F-150s can get pricey. The top-line Limited starts at $61,815 and with every option it can cost around $67,000. To see what people in your area are paying for their new trucks, check out the Kelley Blue Book Fair Purchase Price. As far as resale value goes, the 2018 Ford F-150 holds its own among its competitors, with the Toyota Tundra being the standard bearer of the bunch. The base-model F-150 is a regular-cab, 2-wheel-drive (2WD) XL, which comes with enough standard equipment that makes it possible to buy a decent truck to get work done at a reasonable price. Even trucks equipped with the new 3.3-liter base engine and 6-speed automatic transmission come standard with auto start/stop, and all F-150s get the same ultra-strong hydroformed, fully boxed frame. Hill-start assist and Trailer Sway Control are standard, as are Curve Control, 17-inch wheels and air conditioning. There are plenty of appealing upscale trim levels, including the King Ranch, Platinum and Limited. Available options make the interior luxury plush, such as heated leather front and rear seats (10-way-power, cooled and massaging front seats), Sync 3 and Bang & Olufsen Play or Sony audio systems. A variety of towing assist and safety systems are offered, as are adaptive cruise control and side steps that deploy when a door is opened and retract when the door closes. On the safety front, the 2018 Ford F-150 is offered with inflatable rear seatbelts and a blind-spot information system. Four-wheel drive (4WD) is available. The 2.7-liter EcoBoost V6 engine has as much torque as the available 5.0-liter V8, has the best fuel economy of the gas engines, and has the power to tow up to 8,500 pounds, plenty for a boat or RV. It's the sweet spot in the lineup and the best-selling engine. When parking a trailer, Pro Trailer Backup Assist allows the driver to input left or right commands via a knob, watching on a screen as the F-150 handles steering and braking. The Blind Spot Information System covers truck and trailer. The 360-degree camera eases the task of connecting a trailer. The 2018 Ford F-150 will be available with six engines, one of which is a new 3.0-liter turbodiesel set for release later in the model year. The new base engine is a 290-horsepower, 3.3-liter V6 -- more powerful and more efficient than the engine it replaces -- and the only one in the line with a 6-speed automatic. The rest use a 10-speed automatic, including the 2.7-liter EcoBoost V6, now with 25 lb-ft more torque than last year and the best fuel economy of all the gas engines. The 5.0-liter V8 gains horsepower and torque, and both versions of the 3.5-liter EcoBoost remain unchanged. However, thanks to a new towing package and other changes, you can now tow up to 13,200 pounds with a 3.5-liter-equipped F-150. When it comes to the battle for truck supremacy, it's down to Ford, Chevy and Ram, which are also the three top-selling vehicles in America. Ford stays at the top of the heap thanks to constant innovation that makes it easier to get work done while increasing luxury and comfort. With the F-150, Ford has advanced the design of a full-size truck beyond what its competitors are doing, including use of an aluminum body, a 10-speed transmission and tech features that make it easier to tow a trailer. For the 2018 Ford F-150, there are plenty of engine choices: a traditional V8, a new base V6, and three EcoBoost engines that deliver plenty of power for towing and hauling as well as respectable fuel economy. A forthcoming a turbodiesel V6 will round out the power offerings. 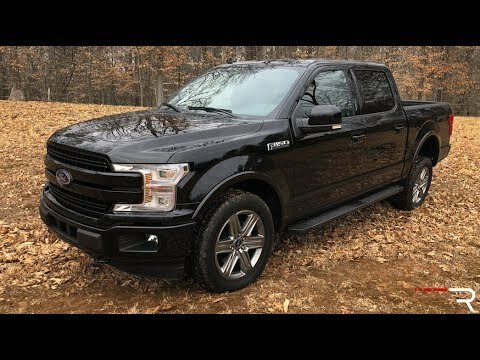 2018 Ford F-150 XLT V8 Review - BEST TRUCK EVER?! On January 14, 2019, I bought a brand new 2018 f 150 drove it home from the dealership and there was a puddle of oil under the truck,the next day I returned the truck to the dealer . I waited over a week to have the seal replaced.When I got the vehicle home finally, the next day there is another puddle of transmission oil under the truck again. I returned it again to the dealer to have them try and determine why it was still leaking fluid. After the dealership having my truck for 2 weeks could not really determine why the transmission was leaking. They thought it was some valve but weren’t sure and didn’t know the cause. After a lengthy discussion the sales manager intially said they would just replace the truck with another unit which was exactly the same because the MacLin Ford dealership stands behind there customer. Then, at the last minute , just prior to transferring my personal item from first truck to the replacement truck the sales manager said they needed $14,000 difference. I had paid cash for the initial purchase. After getting lead down the garden path and him trying to shock me into writing him a cheque we had words and I was not to polite to say the least. It has been a month since the initial purchase ( paid cash) of my new Ford F-150 and it is still sitting in the dealership supposedly awaiting on Ford parts. They are saying it could take a couple more weeks. After buy 19 new ford vehicles throughout my life . Dealing at MacLin Ford in Calgary has been the worst vehicle purchasing experience ever, bar none! The limited miles/kilometres I have driven it back and for to the dealership to try and get it fix doesn’t really give the true driving experience one should hope for. But other than these issues with this particular truck I think Ford still builds a decent truck. Great value for the money, excellent reliability and quality so far. The current length is not long enough. Writing an academic essay means fashioning a coherent set of ideas into an argument. Because essays are essentially linear—they offer one idea at a time—they must present their ideas in the order that makes most sense to a reader. Successfully structuring an essay means attending to a reader's logic. The Focus of such an essay predicts its structure. It dictates the information readers need to know and the order in which they need to receive it. Thus your essay's structure is necessarily unique to the main claim you are making. Although there are guidelines for constructing certain classic essay types (e. G. , Comparative analysis), there are no set formula.